Recent UTD grad Amon Simutowe leads the U.S. Open (July 28-August 5) Traditional schedule 5-0. 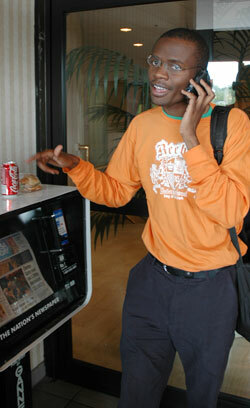 The Zambian-American IM Amon Simutowe is now focusing full-time on chess, chasing the GM title. (Bhat, Caruana and Kraai have set a good example so far! )The action will heat up for Amon, and everyone else, when the Traditional, 5-day and 6-day schedules merge tonight. Hikaru Nakamura and Alexander Shabalov are both in the 5-day. In his fifth round game against NM Ralph Zimmer, Amon Simutowe, playing black, found a winning shot in the following position. Can you find it? Here is the full game where you will find out what Amon did play. Sergei Kudrin played the role of Sicilian professor against Kentucky's Denker representative, Maxx Coleman. In the final position after 22. Bc4, Coleman resigned because Bxc4 fails to Qc6+ Ke7 Bxc3 Qxc3 Qd6+ mating while Bxd2 loses to the simple Bxe6. In the six-day, 2007 High school co-champion Michael Zhong won against the higher rated John Bick. IM Justin Sarkar and U.S. Junior Championship Marc Arnold play today to determine the leader in the 6-day.Watch the game live (as well as many others) on monroi.com.